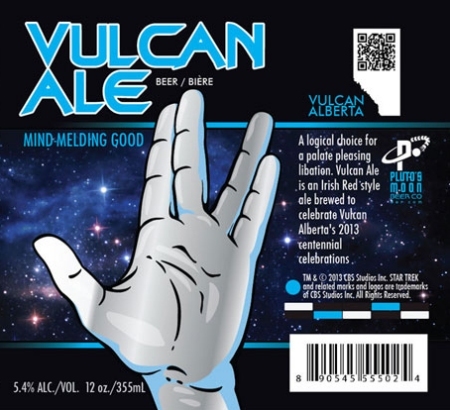 VULCAN, AB – The small town of Vulcan, Alberta is hitting its centennial milestone this year, and to help mark the occasion, Calgary-based beer importers Delancy Direct have commissioned a beer that plays up the town’s tourist-oriented connection to the planet Vulcan and character Mr. Spock from Star Trek. An Irish red ale brewed to 5.4% abv, Vulcan Ale is described as “mind meldingly good,” and a “logical choice for a palate pleasing libation.” It is ostensibly brewed by Pluto’s Moon Beer Co., although a closer look at the label reveals that it is being brewed at Harvest Moon Brewing in Montana, one of the many American craft breweries in the Delancy portfolio. Vulcan Ale will be available starting May 1st, and will be a feature beer at the Calgary International Beerfest on May 3rd and 4th. It will remain available through the summer, leading up to the official Vulcan 100 celebrations in August.